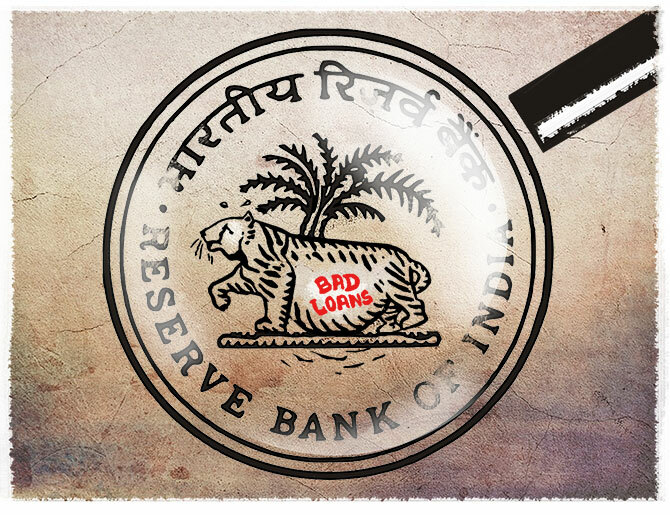 Rediff.com » Business » Will Supreme Court finally end RBI's supreme conceit? For the past 10 years or more, the RBI has been turning down dozens of applications under the RTI Act that sought disclosing the list of wilful defaulters and the RBI’s inspection reports. In fact, it is the only organisation that has a granular and complete view of the heist that has been going on for 25 years at least. But it has escaped any blame for the multiple rounds of bankruptcy and massive periodic recapitalisation of public sector banks caused by bad loans. Perhaps they don’t want anyone to know how incompetent and collusive they have been in handling bad loans, says Debashis Basu. Does the Reserve Bank of India understand the Right to Information Act far better than the central information commissioners, judges of high courts, and even those of the Supreme Court? Since 2006, four RBI governors, dozens of deputy governors and time-serving minions below them seem to think so, to the utter astonishment and despair among citizens and jurists. Will the ire of the Supreme Court end this supreme conceit? Recently, the SC threatened the RBI with contempt proceedings for not disclosing annual inspection reports under the RTI Act. Sadly, this unseemly tamasha has been going on for years. Both the apex court as well as Central Information Commission had held the RBI could not refuse to put the annual inspection reports of banks in the public domain. But the RBI has cont­i­nued to be adamant. We, at Moneylife, are not surprised. There is a reason for this breathtaking arrogance. For decades, the RBI has got away, no matter how egregious its bungling is. Its antiquated systems and processes were the main reason behind the securities scam. The governor and deputy governors who live in a rarefied zone were clueless about the functioning of the Public Debt Office and how brokers and bankers were running riot. For 25 years, public sector banks have been looted by borrowers -- both big and small -- in collusion with bankers. The RBI has nominees on the bank boards, has unrestricted access to the banks’ books, approves statutory auditors, gets banks to send reports every month, quarter and year, and has a hand in the appointment of chairmen and executive directors. Indeed, under successive erudite governors, including “public intellectual” Raghuram Rajan, the RBI has, in fact, helped ever-greening of bad loans through ingenious schemes like corporate debt restructuring (CDR), strategic debt restructuring, the Scheme for Sustainable Structuring of Stressed Assets, CDR2, and 5/25, which have all failed. And even as the RBI’s regulatory lapses pile up sky-high, it has instinctively sided with bankers in their anti-customer policies and actions. When Moneylife Foundation filed a PIL petition in the Supreme Court on the loot of borrowers through the floating rate regime, the court asked the RBI to reply but the RBI has ignored the court directive. Its response makes no reference to the issues raised in court. Why has the RBI’s legal insight on the RTI Act escaped even the judges of the SC? The RBI argues the reports asked under the RTI are “fiduciary information” and, hence, cannot be placed in the public domain. This is ridiculous. A regulator forces regulated entities to statutorily report certain information. How can that be a fiduciary relationship? The RBI has no legal duty to maximise the benefit of any public sector or private sector bank and thus there is no relationship of “trust” between them, argued Prashant Bhushan in the SC. Indeed, the SC has already ruled the RBI is not in any fiduciary relationship with any bank. The question is: How long will the RBI be allowed to be obdurate? Way back in December 2015, the SC told the RBI the banking regulator could not withhold information citing “fiduciary relations” under the RTI Act. Hearing a set of transferred cases, a division bench of Justice M Y Eqbal and Justice C Nagappan said, “From the past we have also come across financial institutions which have tried to defraud the public. "These acts are neither in the best interests of the country nor in the interests of citizens. "To our surprise, the RBI as a watchdog should have been more dedicated towards disclosing information to the general public under the Right to Information Act. "We also understand that the RBI cannot be put in a fix by making it accountable to every action taken by it. Despite such a clear-cut order, more than three years later, even the SC is struggling to make the high and mighty RBI see sense. Even in January 2019, the SC said, “The RBI ought to act with transparency and not hide information that might embarrass individual banks. Also, in Mardia Chemicals Ltd vs Union of India (decided on April 8, 2004), the SC observed that private transactions when large enough took the character of public interest, especially since banks and financial institutions utilised “the money of the people in general namely, the depositors in the banks and public money”. It is impossible to believe that RBI officials don’t get all this. Perhaps they simply don’t want anyone to know how incompetent and collusive they have been in handling bad loans. What is RBI's February 12 circular all about?